Such has been the administration’s disdainful response to every antiwar protest since, and the bloody occupation of Iraq rages on. To the taxpayer, these numbers mean that at a bare minimum over half of every tax dollar that Congress has control over through the appropriations process – also known as the discretionary budget – will go to the current wars or for maintaining the military establishment. Since marching has proven so fruitless against this administration, those working for peace may want to voice their dissent through tactics that sever the flow of tax dollars to policies they find morally reprehensible. The National Campaign for a Peace Tax Fund has sought to create such an option by lobbying Congress to extend conscientious objector status to taxpayers. Legislation that would support the diversion of federal income, gift and estate taxes from conscientious objectors to a nonmilitary life-affirming fund has been proposed in every Congress since 1972. Despite the bill’s benefits – restoring freedom of religion as protected in the first amendment, stimulating thought on moral convictions, and actually increasing tax revenue by spending less on the cost of forced collections from protesters – Congress has been remiss to pass it, fearful of jeopardizing its ability to wage war. Still, there are plenty of supporters within the legislative branch. Representative John Lewis of Georgia is set to reintroduce the bill to the House in the coming weeks. Until a hearing is scheduled, the best course of action to support this legislation is to write, fax, email, visit or call your representative and urge them to cosponsor the Religious Freedom Peace Tax Fund Bill. For those whose conscience demands action now, there is another option, carved out by a long history of war tax resisters. According to the War Resister’s League, tens of thousands of Americans – including Dorothy Day, Joan Baez and Noam Chomsky – have at some point resorted to civil disobedience by not paying their taxes since World War II. 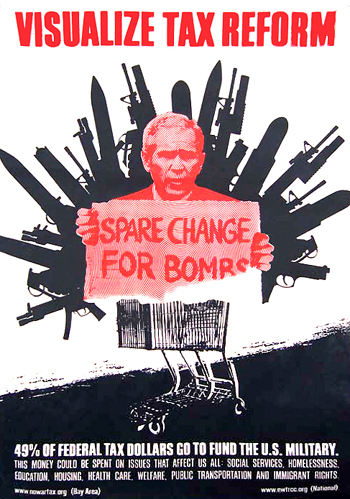 Some resisters have deliberately chosen to live below the poverty line to avoid paying taxes, while others simply do not pay part or all of what the government demands for its addiction to war. These actions no doubt come with risk and sacrifice, but it’s often not as bad as people think. Only rarely has anyone lost their house or car or faced jail time, while many have resisted for decades without significant consequences. The War Resisters League and the National War Tax Resistance Coordinating Committee offer numerous resources on their websites concerning every facet of this form of resistance, as well as contact information for local support groups.